For anyone who’s been reading this blog for more than, say, five minutes, it will come as no surprise to you that I woke up with baby on the brain. This has accidently turned into a baby blog, hasn’t it? It’s mostly temporary, so anyone who wants to hear more vintage, more funny, more anything other than baby needs to just sit tight. I swear, it’s almost over. 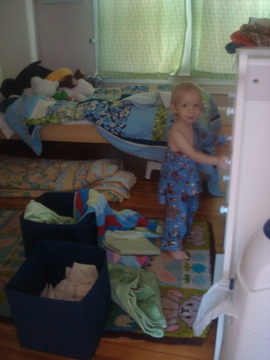 This is sometimes what we find in the morning upon going in to get Dash from his room. Everything pulled out of the drawers (and look how he’s going back for more! ), and some of his clothes pulled off caveman-style. Last night I dreamed about having this baby (or actually NOT yet having the baby, which is so in keeping with my day to day life. isn’t dreaming supposed to be different from everyday life? that’s what i thought too. ), I dreamed about friend’s babies, and about friends who don’t even have babies yet having babies (yes, robyn. I’m talking about you). Good god, it’s a baby fest and won’t it be great when I can return to regular old weird dreams involving the Incredible Hulk and high school biology class? Have you heard? Amanda had her lovely new baby (with a great great name!). And our dear friends Alex and Dan welcomed their triplets on Sunday (11/23- is that not the perfect date for three?). Neil and I have been glued to their blog, waiting for the next installment. Luckily, Dan seems to have a lot of free time and, as a new father, a whole lot to say. This morning, with toothbrush in hand, I tuned in to see what was new and found this lovely entry. I don’t think I’ve ever cried while brushing my teeth before. It’s a beautiful and intimate peek of their journey into parenthood and is well worth the read. Enjoy! I’ll be back later with more non-baby related news. p.s. “baby baby baby” is a song by Anna King, one of James Brown’s backup singers. It was the song we first danced to at our wedding, and though we didn’t realize it was some kind of fertility song, it sure did turn out that way. Sorry, couldn’t find the song online to share with you. Anyone have it? This entry was posted on Monday, November 24th, 2008 at 12:14 pm	and is filed under Dork Mom. You can follow any responses to this entry through the RSS 2.0 feed. You can leave a response, or trackback from your own site. Hey there Happy Dash! Thanks for the super sweet shout out! Happy to be co-kid-blogging alongside ya!